- Convergent plate boundaries are places where lithospheric plates are moving towards one another. - Plates only move a few centimeters every year so collisions are slow and can last millions of years. - When the plates collide the result can vary from earthquakes, volcanic activity, and deformation of the crust. - Are convergent boundaries dangerous places to live in? - Millions of People live and visit beautiful mountain ranges being built by plate collisions. - Each year thousands of people are killed by earthquakes and volcanic eruptions in those areas. earthquakes, and you can evacuate areas around volcanoes when they are about to erupt. - When an oceanic plate collides with a continental plate, the oceanic plate is pushed below the continental plate. - When the oceanic plate pushes the continental plate up it can become a mountain. - The place where an oceanic plate goes down under into the mantle is called the subduction zone. - When the subduction zone is along an oceanic-continental boundary, it creates a deep-sea trench. - Volcanoes can also be created by oceanic-continental convergence. - When the magma is formed it is pushed through the upper plate forming volcanoes. - This is how many volcanoes and mountain ridges are formed. - When two oceanic plates collide the older, colder, and denser one bends and sinks into the mantle. - Magma then rises to create volcanoes and new crust. - When two oceanic plates collide it could also create deep-sea trenches like Challenger Deep. 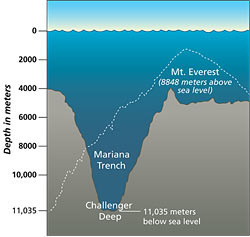 - Challenger Deep is more than two kilometers larger than Mount Everest. - When two continental plates collide neither are subducted. - Instead they crumple up and tall mountain ranges form. - Earthquakes are commonly found at these convergent boundaries. - Volcanoes are not formed at continental-continental boundaries.